Every year the new edition of the Yearbook of American and Canadian Churches publishes the membership figures for all the Christian denominations in the USA . Heading up the list of protestant churches is the Southern Baptist Convention (SBC), very much the flagship denomination of Evangelicalism . However, despite a century of strong growth, the SBC has turned a corner and is now showing an annual decline in membership. Decline was once the province of the liberal churches; the conservative ones typified by growth . Not surprisingly such decline in the heartland of American Evangelical Christianity has not gone without note . 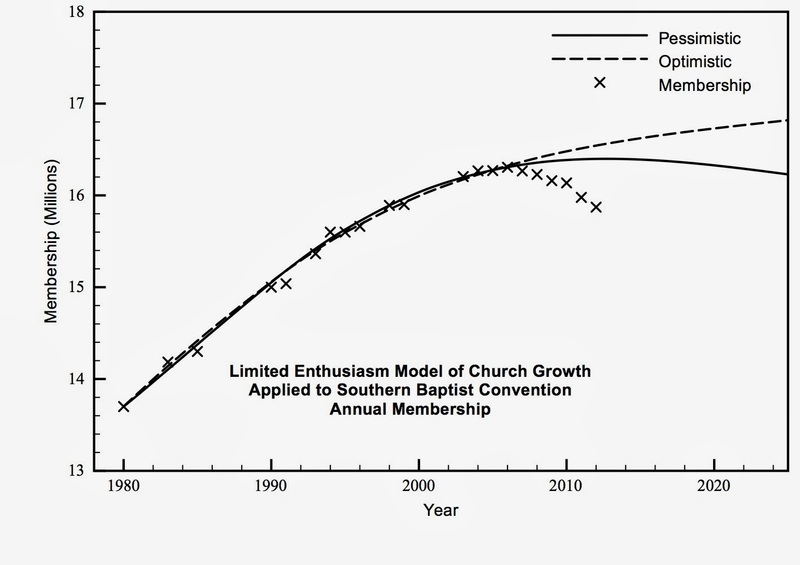 Back in 2002 I applied the Limited Enthusiasm model  of church growth to a number of USA denominations, including the SBC. At that point the model showed that the SBC had experienced the sort of growth associated with revivals, but it had slowed before 2000. The model predicted growth would continue to slow and would be followed in the 2000s by a small decline. That decline would be a natural phenomenon called overshoot, often seen when there has been previous rapid growth. Overshoot occurs in a population when it exceeds its natural equilibrium value, often caused by its growth mechanism depending on a smaller subset of the population than that which governs its decline . The subsequent decline ultimately causes the population, the church in this case, to re-balance at its equilibrium value, albeit over timescales of many generations. The SBC result was published in a paper in 2005 . So with news of that denomination’s actual decline, I was keen to apply the model again to see if the decline matched the predictions. If so, the decline in the SBC could be a temporary re-balancing, rather than the start of a long-term trend. To get a sense of perspective I will look at the SBC data from 1980 onwards in comparison to earlier figures. Figure 1 shows membership from 1950 . The growth of the SBC is impressive, and the decline from 2006 is quite small by comparison. This is not a church that is going to disappear in the next 20 years! To get an idea of how much of this growth was making inroads into converting the USA population, the membership figures are compared with the population, expressed as a percentage (figure 2). 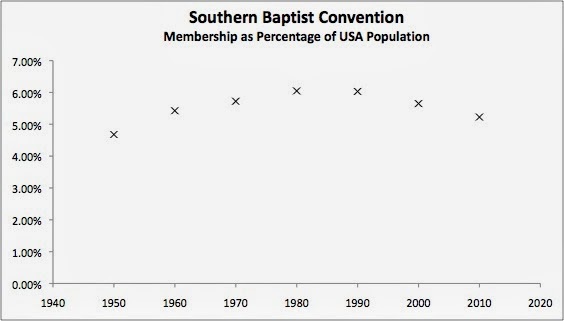 This graph looks less dramatic, showing that the SBC has been losing ground on a growing population since the 1980s. Its downturn from 2006 is not just a result of factors in the 21st century, but must include the outworking of forces at least 20 years earlier. The SBC should have been growing much faster that it was in the 1970s and 1980s to have been considered a strongly growing denomination. That this membership percentage had been rising up to 1980 indicates that conversions were a significant part of its growth prior to that date. There is no evidence that I am aware of that family size among SBC members was significantly larger than the USA norm, the other possible cause. Before going any further it should be noted that the largest protestant denomination in the USA, the SBC in this case, has never been much more than 6% of the population. The strength of Christianity in the USA lies in its diversity rather than in a single denomination, in marked contrast to European countries. To compare the Limited Enthusiasm model with the data, the1980 figure is taken as the starting point. The data fitting technique treats all points equally, so starting earlier will give the past too much priority over recent figures. As the aim is to see if the decline is a natural outworking of the previous growth the data fitting is stopped in 2006 but the model is allowed to run to 2012 to compare with actual data. Because some parameters in the model are difficult to estimate, a range of scenarios are produced, based on whether they predict a moderate growth, or a small decline, between 2006 and 2012. Two such scenarios are given in figure 3, and compared with membership figures . All data fits up to 2006 indicate the church is well above the extinction threshold. However it is clear that even the most pessimistic scenario cannot explain the post 2006 downturn. 1. The leaving rate from the SBC is increasing. If the leaving rate steadily increases from 5% in 2006 to 5.8% in 2012 then this is sufficient to explain the data. A higher leaving rate could be due to members switching to more contemporary churches, or even to more liberal churches; the former being more likely given the even faster decline of the liberal ones. 2. The ability of the SBC to make converts has been falling. This could be due to a lack of confidence among members of the SBC undermining their witness, or an increasing sense of intimidation by non-Christian society. 3. The general population is becoming less open to the SBC, whether other Christians who could potentially join, or unbelievers. Either way a greater proportion of non-SBC people are hostile to the SBC. The decline could be a combination of all three effects [10,11]. If the leaving rate continues to rise, as suggested by the recent data, then the effect on the SBC membership figures will be dramatic (curve 1. figure 4). The church will drop to almost 12 million by 2025, well below its 1980 figure. If the cause is falling conversion rate (curve 2, figure 4), or an increasing hardening rate of potential converts (curve 3, figure 4) the decline is more dramatic, under 12 million by 2025. If the SBC is not to see serious decline, the source of its drop in membership figures needs to be identified and dealt with. However the model shows that small changes in the parameters can make significant differences in the numbers in the church, thus there will be realistic measures that will improve the parameters and halt the decline. As the SBC is one of the most successful denominations in the USA, has clear beliefs and a commitment to mission, there seems no reason to believe it will not do what is needed to see more conversions and to keep people in church. As such there is no reason why the pessimistic scenarios of figure 4 should happen, provided action is taken now and not delayed. The 15 Largest Protestant Denominations in the United States, Thom S. Rainer, The Christian Post. March 27 2013. Why Conservative Churches are Growing: A Study in the Sociology of Religion. Dean Kelley. Mercer University Press, 1986. The Decline of Evangelical America, John S. Dickerson, The New York Times Sunday Review, 15/12/12. A description of the Limited Enthusiasm model of church growth is on my website. Overshoot can also occur if growth is dominated by births rather than conversion. This is a cohort effect due to changing birth rates and the delay between deaths and births. 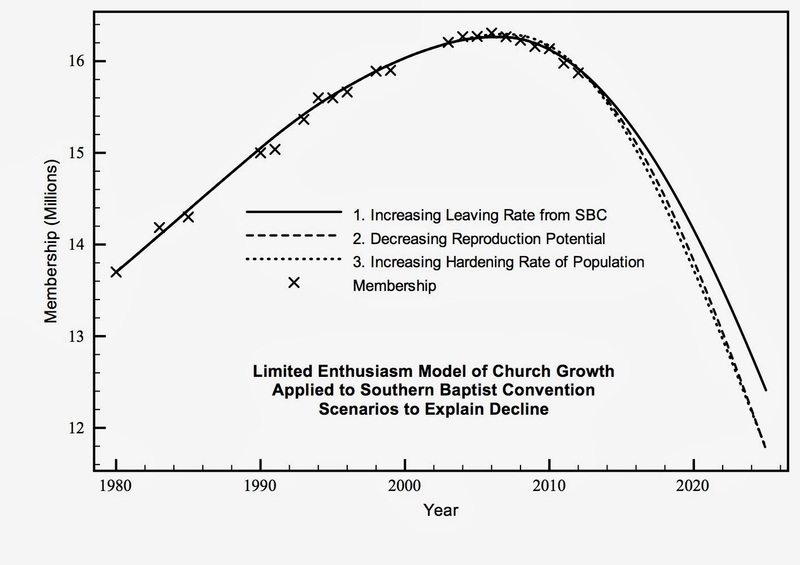 A General Model of Church Growth and Decline, John Hayward, Journal of Mathematical Sociology, 29(3), pp.177-207, 2005. 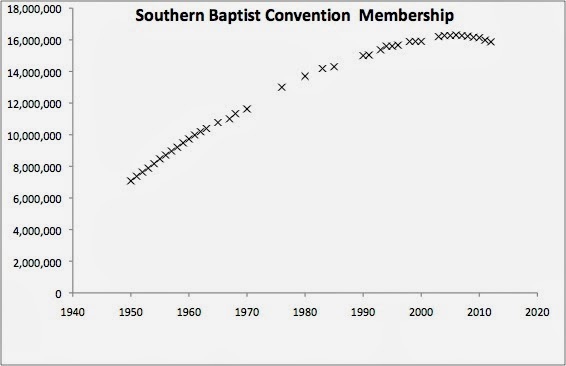 Membership figures for the SBC from 2004 are obtained from the Southern Baptist Annual Reports, http://www.sbcec.org/. Earlier figures are obtained from adherents.com, http://www.adherents.com/, who use a variety of published sources. On a technical note, observe that the down turn in the membership data after the highest point in 2006 is faster, or more curved, then the approach to that point. In social diffusion theory such a turning point is normally explained by a single feedback loop that changes the way it impacts on the population variables; it flips polarity. The result is a symmetrical curve. In the case of the SBC data the down turn is more curved than the growth side, suggesting at least one more process has come into play, possibly another feedback loop. Thus the effect is most likely persistent. Identifying the new processes with certainty would require detailed knowledge of conversion and leaving rates. Wow this is shocking news, that in twenty years time the SBC could be the third largest church denomination in the United States. My two cents is that they should focus on Christ's teachings versus bashing other churches. People see that and find it off putting. Thank you for your comment. It is true many congregations in the SBC have an apologetic ministry often aimed at other Christian groups, as apologetics tends to be. It is not clear whether that has a detrimental effect on recruitment/retention (putting people off - or sidetracking SBC from evangelism), or a positive effect (it could attract people looking for certainties and recruit from other churches). Both are reasonable suppositions, but the data is not there to distinguish. There is rarely just one cause of decline. In the SBC's case the changing context of secularity in the USA, more competition from new paradigm & charismatic churches, some self satisfaction leading to less missionary zeal, appealing less to younger people, and changing racial demographics are probably all in the mix.